Having sampled some delicious canapés at the launch, Paulo and I returned for a proper dinner on a rainy Wednesday night. 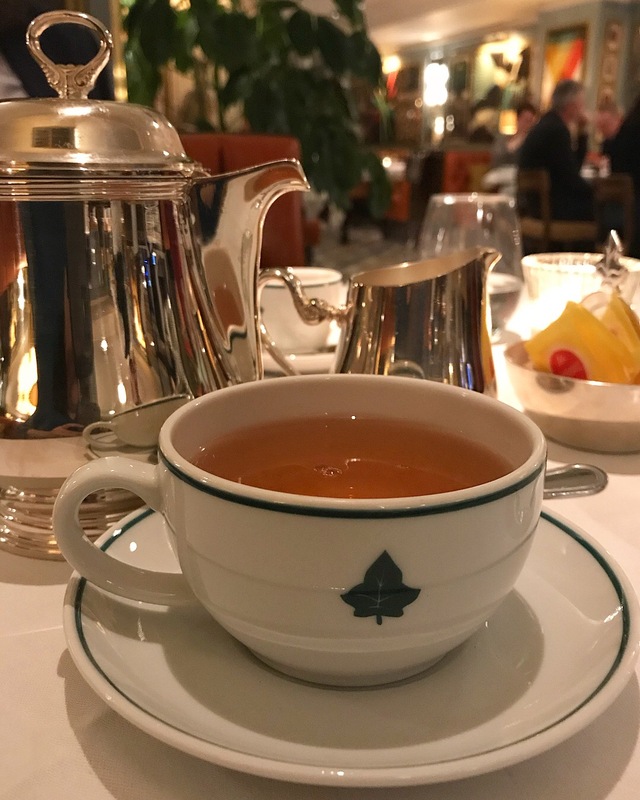 Service was impeccable from start to finish. We were greeted warmly and efficiently at the door where they offered to check our coats, then showed us to our table. 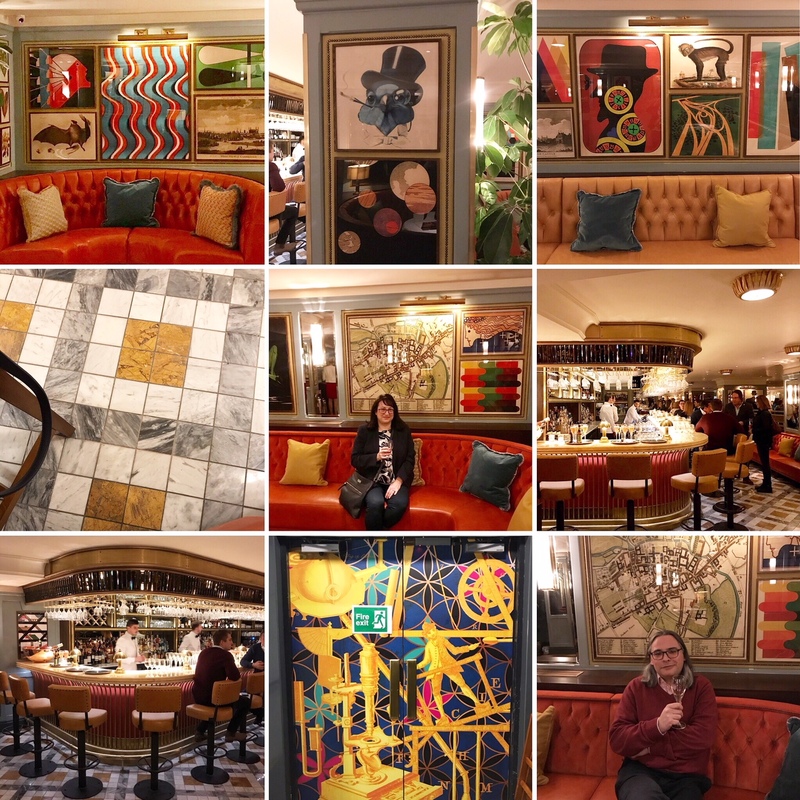 The circular banquette meant I could sit next to Paulo and easily look around… and yes, I did spot a Cambridge celebrity at the bar! We started off with some still water (served in a lovely branded bottle) and cocktails. 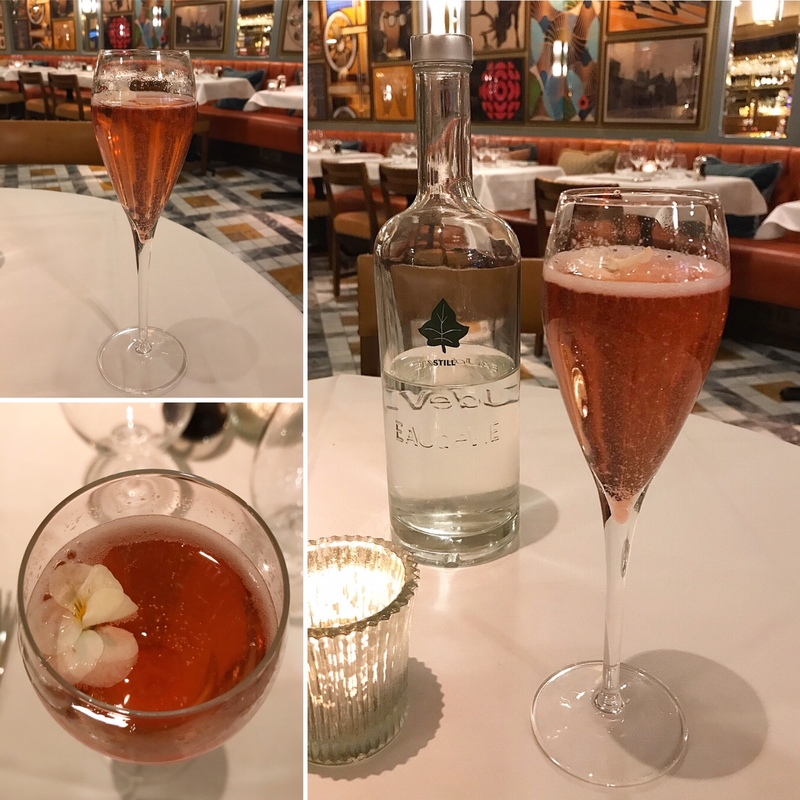 I kept it simple with The Royale, their signature Kir Royale with Sipsmith sloe gin, Briottet Rose liqueur and Champagne, garnished with a hibiscus flower. Served in a flute, this refreshing cocktail had a delicate taste of rose petals. 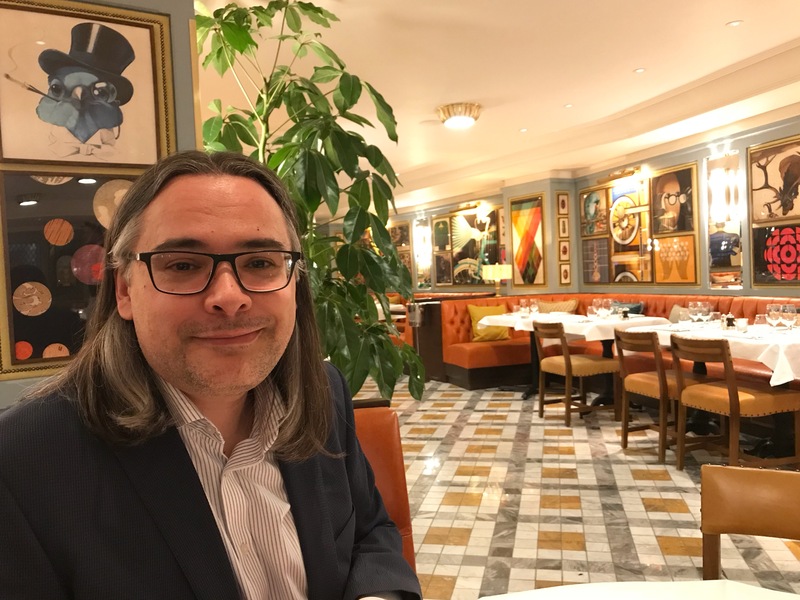 In true diva fashion, Paulo chose one of The Ivy’s most spectacular cocktails. 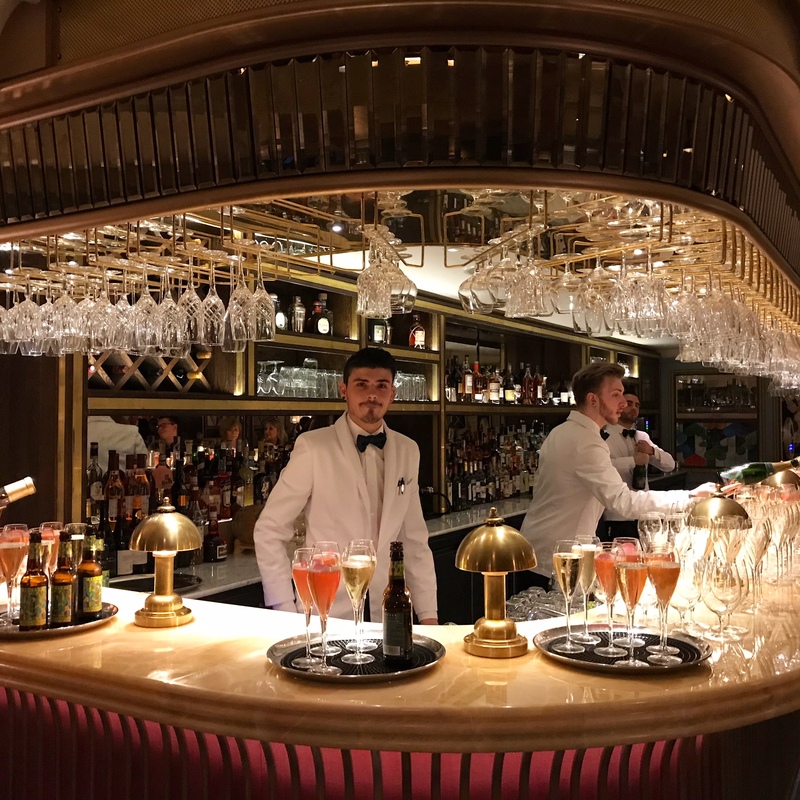 A Gentle Tipple was one smokin’ cocktail – literally! I missed taking a photo but the cocktail arrived in a smoky bell jar. When it was lifted (ta-dah!) the smoke hovered over the drink for a short while. 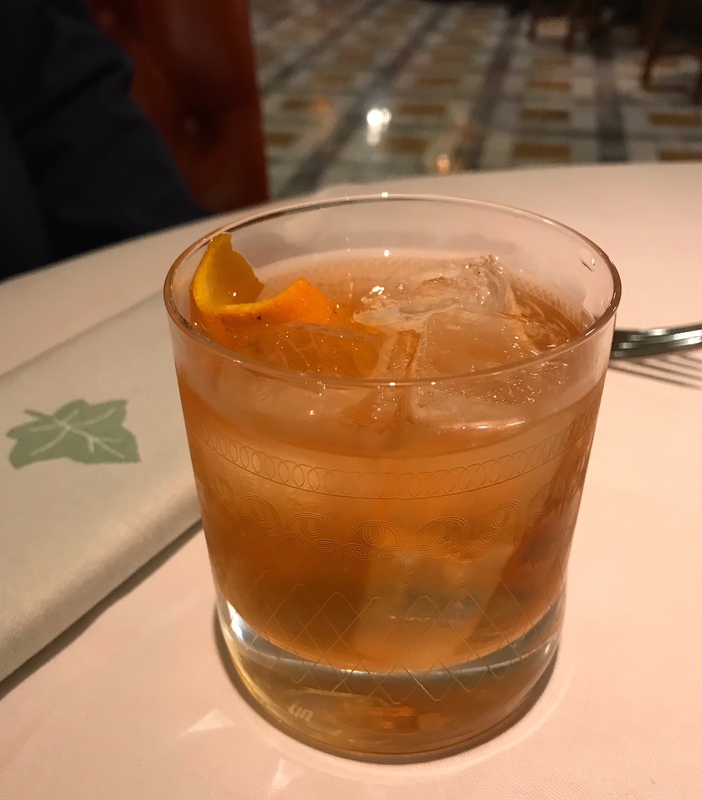 The cocktail was a delicious blend of Bulliet Bourbon, Apricot Brandy, Calvados and Peychaud Bitters aged in an applewood smoke filled barrel. A feast for the senses! We asked our helpful waiter to recommend a white wine and he chose well. We enjoyed our bottle of Suavia Soave Classico, a fresh and fruity Italian wine made with 100% Garganega grapes. It was kept chilled for us and the servers were excellent at replenishing our glasses. 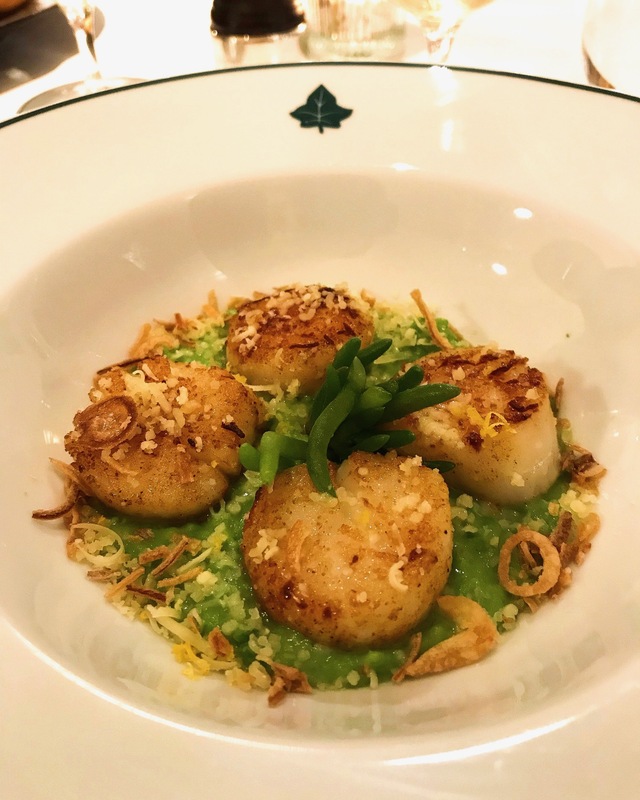 The Atlantic sea scallops in my starter were juicy, plump and, thankfully, not overcooked. They sat on a bed of pea purée with broad beans, a tasty combination of sweet and bittersweet flavours complemented by zingy lemon zest and salty sea cress. The dish was sprinkled with crispy shallots for texture. I expected Paulo’s starter to be run-of-the-mill tempura prawns but I was wrong. 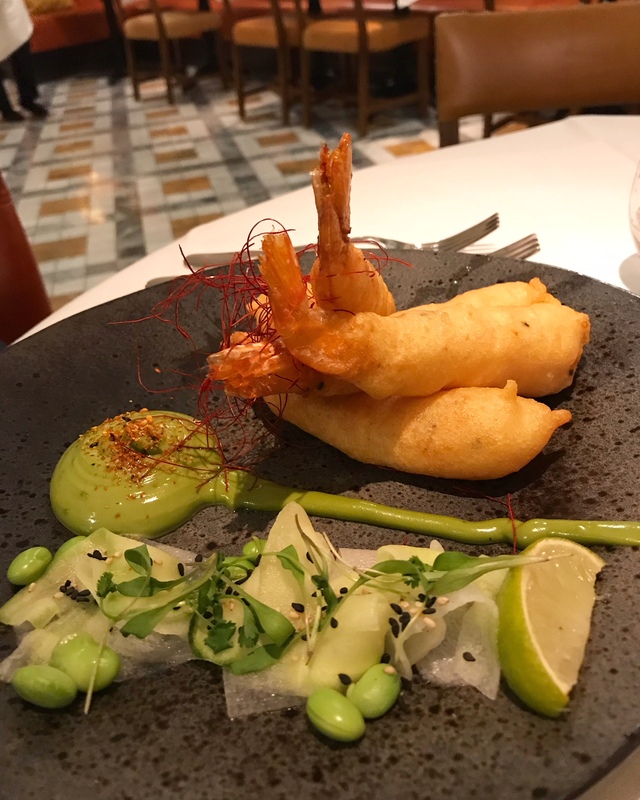 The dish was a work of art featuring Nobashi prawns with pickled mouli, cucumber, edamame and a matcha tea sauce. 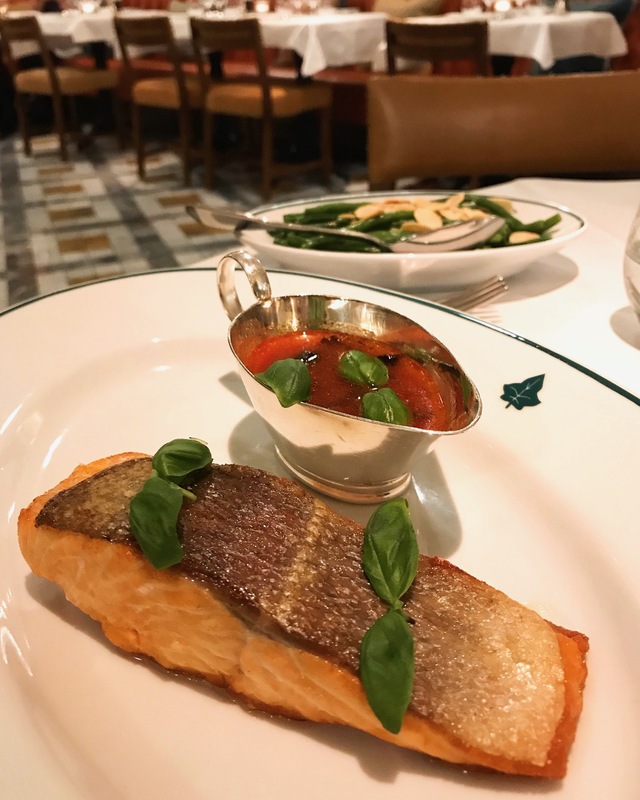 Paulo had sea trout, the “simply grilled” fish of the day. It was served with a flavourful tomato sauce offset by the saltiness of kalamata olives. 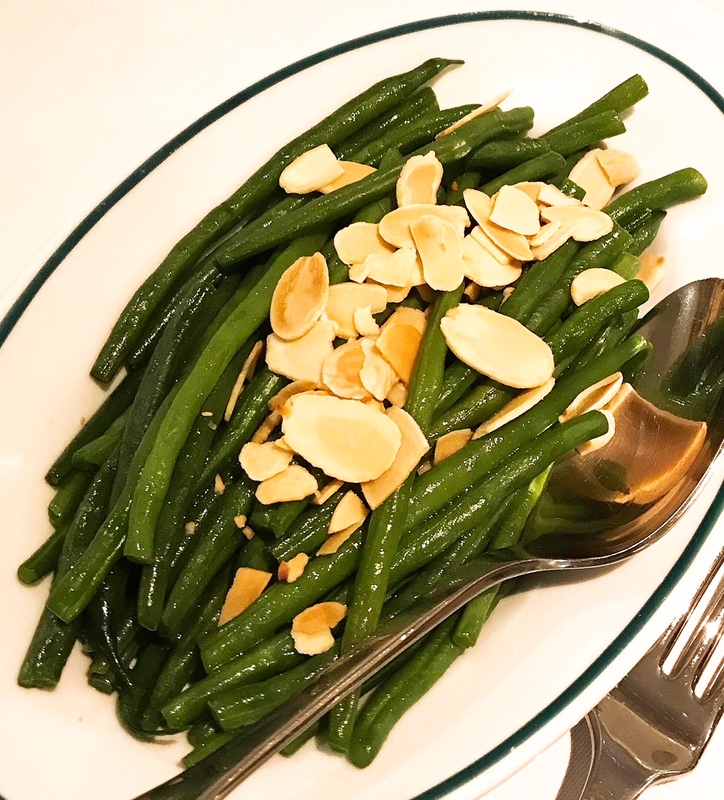 His side dish of green beans (with a nice crunch) topped with roasted almonds was a good match for his main course. 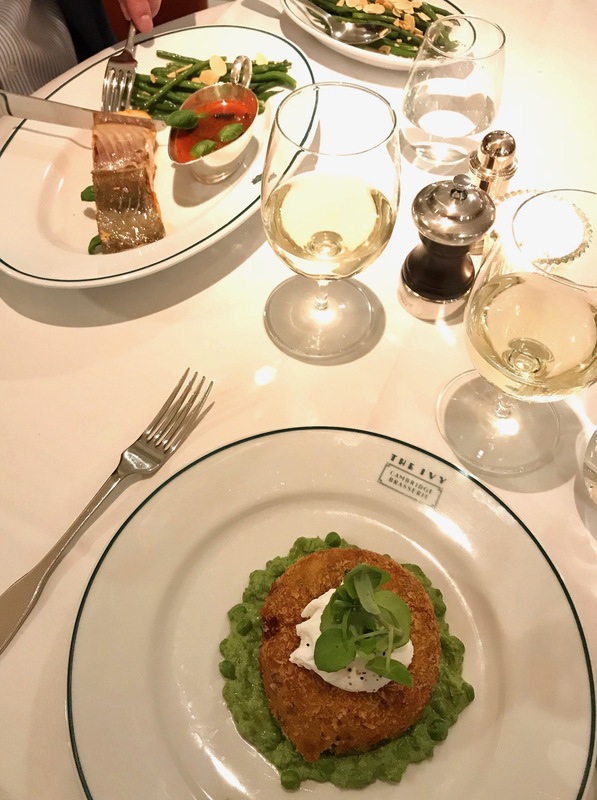 I thoroughly enjoyed my main course of salmon and smoked haddock fish cake on crushed pea and herb sauce, topped with a soft poached hen’s egg and baby watercress. However in hindsight, I could have chosen better as my main course also featured peas so it was a bit of pea overload. I didn’t mind though as I love peas and the fish cake was dense yet fluffy and not the least bit dry. The egg yolk oozed over the top and it was all so delicious. 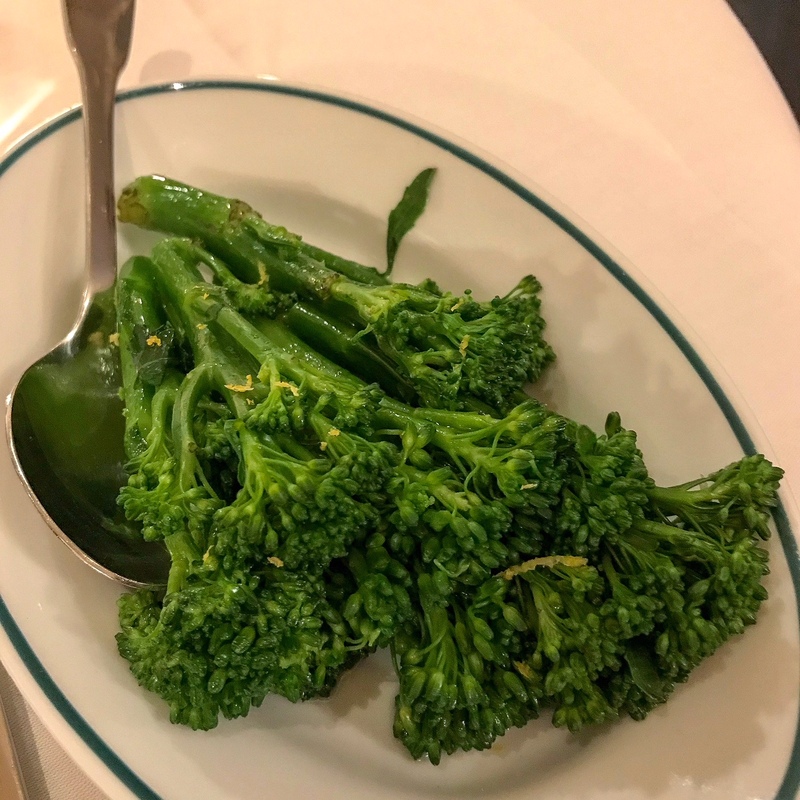 My side dish, tenderstem broccoli with lemon oil and sea salt, was very fresh. Leave room for dessert as they are the pièce de résistance. The chocolate bombe was a real spectacle! The photo above is after the bombe “exploded”. The bombe was originally shaped like a smooth globe and surrounded by milk foam. 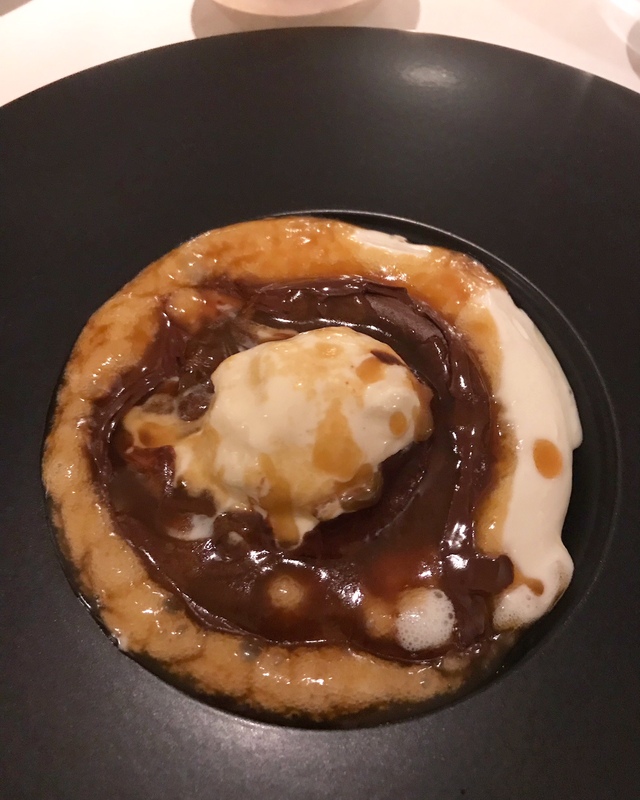 Whilst I was admiring the gorgeous presentation, the waitress poured hot salted caramel over the chocolate bombe, melting it and revealing a scoop of vanilla ice cream. However, the most unexpected delight was the popping candy in the honeycomb base. An explosion of flavours indeed. This dessert was the bomb! Paulo’s dessert had the wow factor as well. The apple tart fine featured thinly sliced apples layered in a flower-like arrangement on a flat disc of flaky, buttery puff pastry. In the centre sat a scoop of vanilla ice cream. 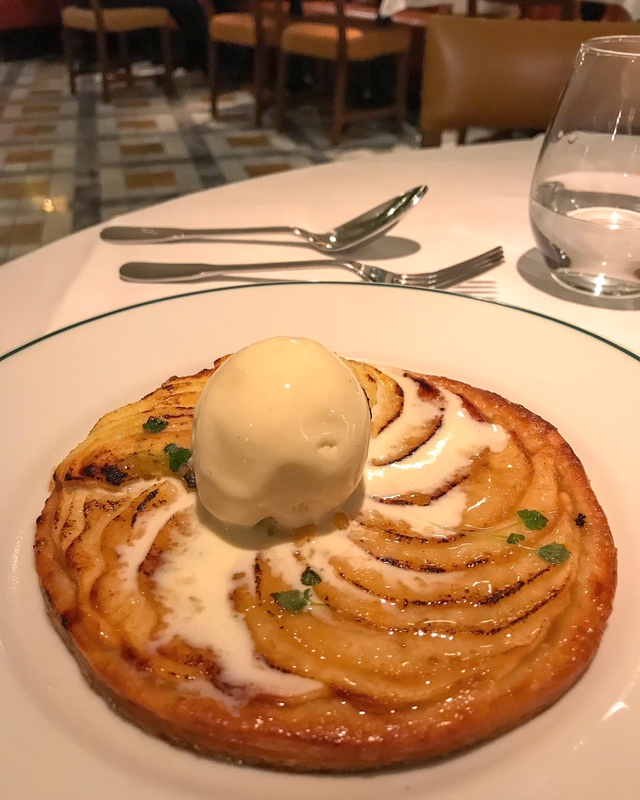 The waiter expertly flambéed Calvados (French apple brandy) in a pan and poured the flaming liquid in a circular motion over the disc, infusing flavour into the tart and also slightly melting the ice cream. Watch the video! Paulo enjoyed an excellent espresso. 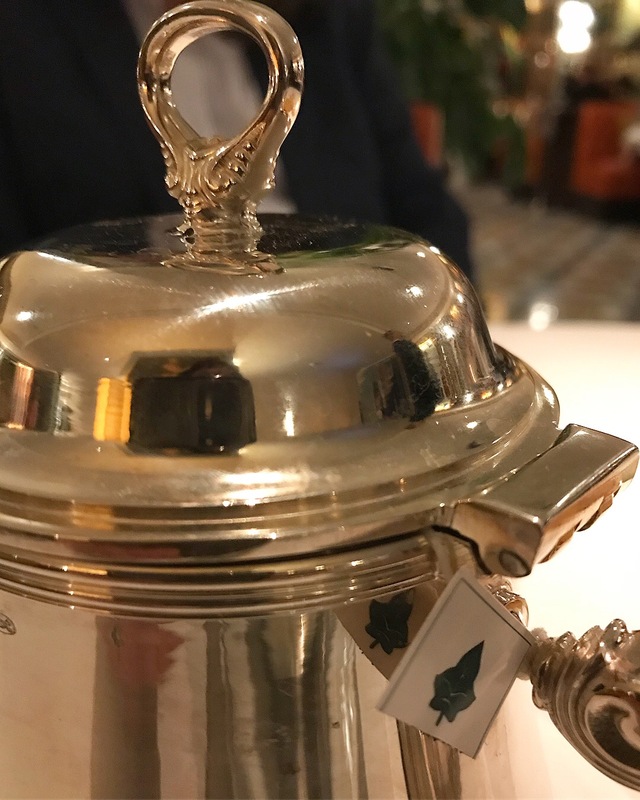 Tea for me – the rich and intense Ivy 1917 breakfast blend, served in a luxurious silver teapot. What a sumptuous way to end the meal. 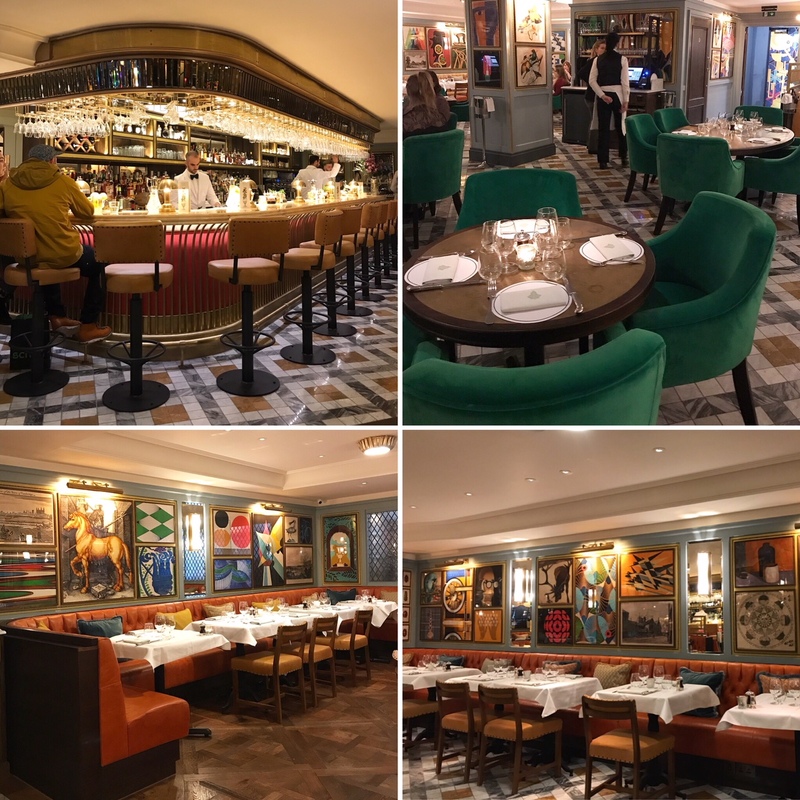 I can already tell that The Ivy Cambridge Brasserie is making its mark. We had an early reservation on a Wednesday but the place steadily filled up with customers as the evening progressed. I recommend making a reservation but they still hold back a number of tables for walk-ins each day so no one is turned away at the door. 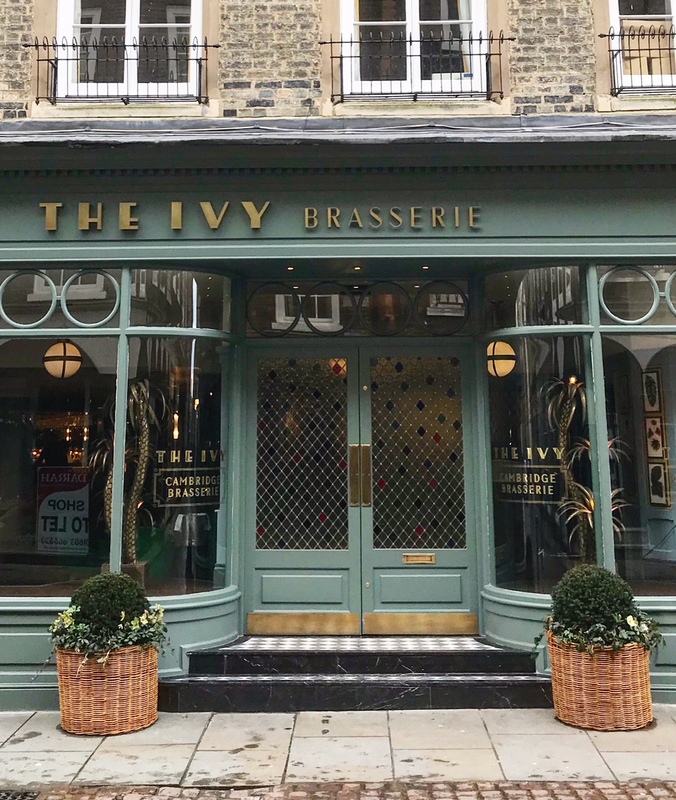 The Ivy Collection has been quickly expanding over the past 3 years with over 20 brasseries (Norwich is next) and a handful of cafés to date. 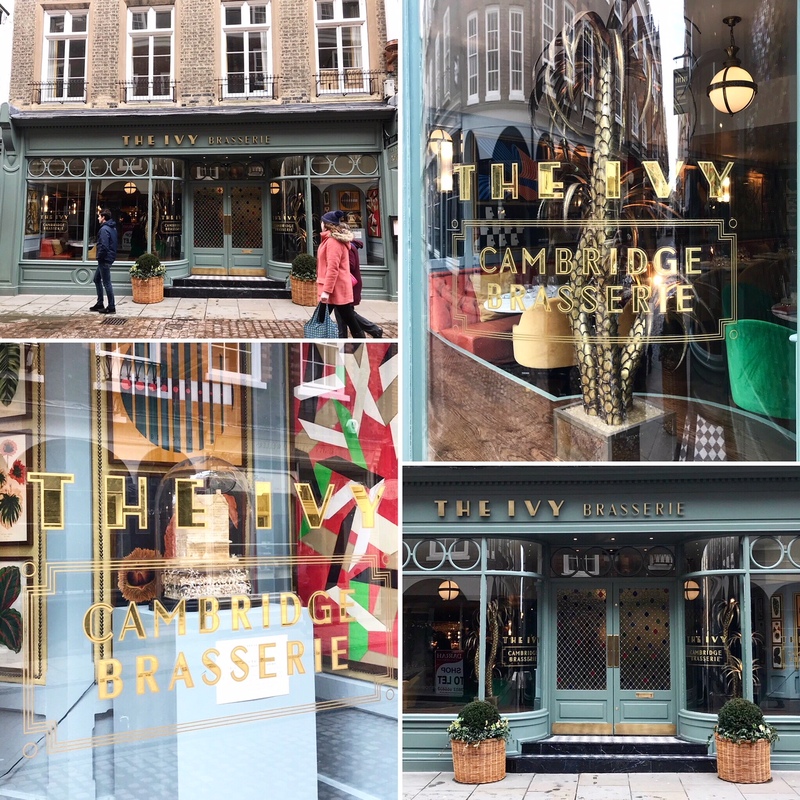 They need to ensure they safeguard the century-old heritage of The Ivy, do it justice and not water down the brand. 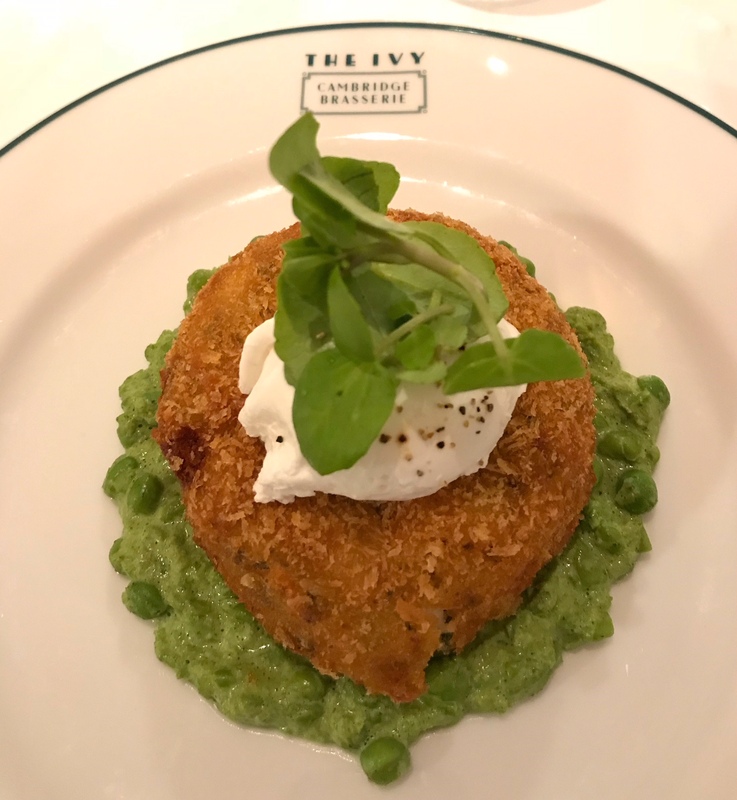 This remains to be seen but I can firmly say that the food, drinks and service we experienced at The Ivy Cambridge Brasserie were top notch – all delivered in an elegant and laid back ambience. Definitely not a case of style over substance! 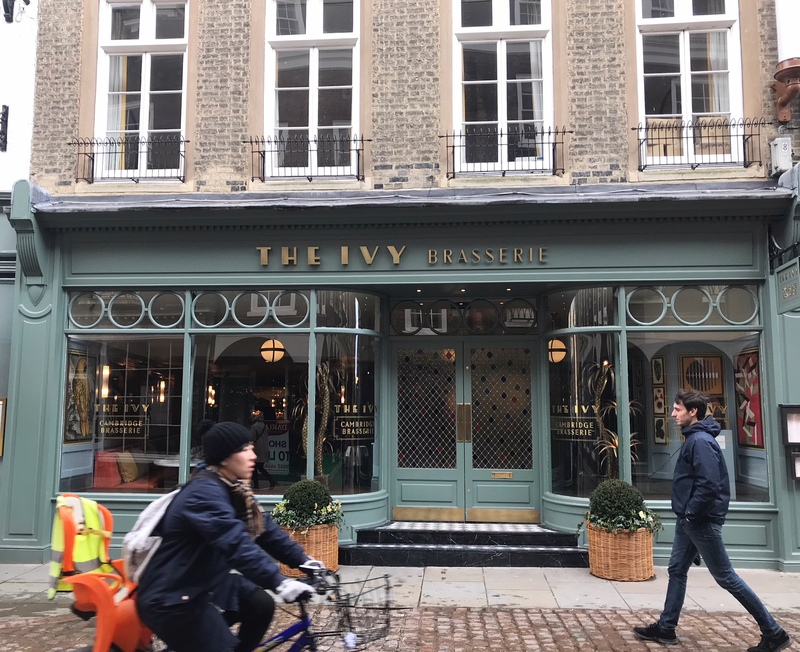 I was invited by The Ivy Cambridge Brasserie. Although the food and drinks were complimentary, all views are my own. I did not receive compensation for my review. 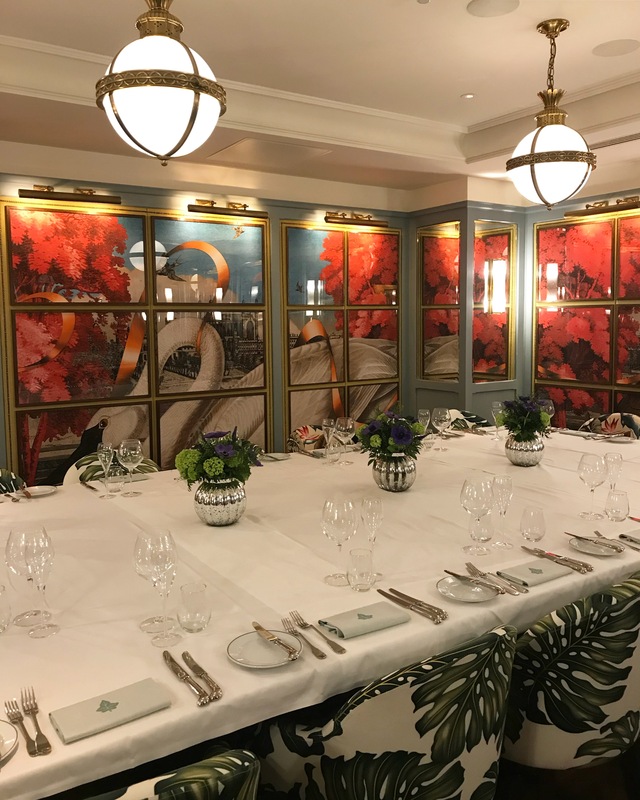 This entry was posted in Restaurants and tagged apple tarte fine, art deco, Calvados, Cambridge, chocolate bombe, Dubo Jelicic, fish cake, flambé, Ivy 1917 breakfast tea, Newton's Apple, Nobashi prawns, scallops, sea trout, Stuart Conibear, tempura prawns, tenderstem broccoli, The Boat Room, The Ivy, The Ivy Cambridge Brasserie, The Ivy Collection, Trinity Street by One Two Culinary Stew. Bookmark the permalink.